Sheet music covers were always very topical. This illustration depicts Queen Victoria and Prince Albert dressed in their finest clothes, receiving the Emperor Napoleon and the Empress Eugene of France. The men are wearing uniforms and the women have beautiful dresses which were very fashionable outfits for attending balls. They are off the shoulder, emphasise the fashion for tiny waists and are held in shape by a crinoline undergarment. 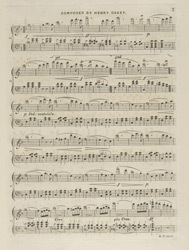 The Royal visitors came to England on a number of occasions, most notably in 1856, at the time of the Crimean War, so it is likely that this sheet music can be dated to this time.